one easy chord grip and a four-to-the-floor strumming pattern to play the essential changes of a 12 bar dominant blues in G.
a second grip and a swing strumming pattern to play the basic changes of a dominant blues in any key. how to add a VI7-II7-V7-I7 turnaround to a dominant blues. This class is perfect for beginners and advancing students can go further by enrolling in the follow up courses that teach other Freddie Green grips including minor 7th and major 6th. Freddie Green was the long-time rhythm guitarist of the Count Basie Orchestra and pioneered a simple, but effective set of chord grips and strumming pattern that helped make the Basie's rhythm section the envy of every band of that era. 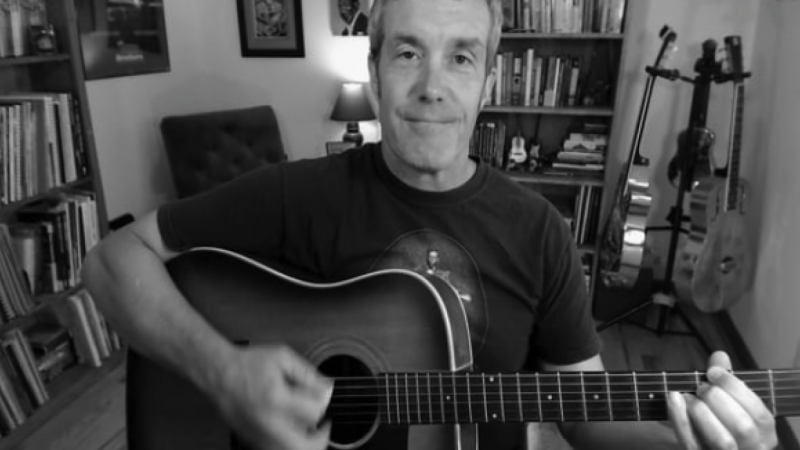 Scott Perry, author of Creative On Purpose, is a husband, father, teacher, and musician from Floyd, VA USA. Scott inspires creative people like you to achieve their potential as artists. This requires developing your craft with intention and delivering work that matters to those that need it. Scott's done this as a successful musician and teacher for over 30 years.